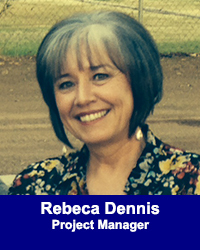 Rebeca Dennis - California Consulting, INC.
Rebeca has over 25 years of experience in the housing development industry in Southern California. Throughout her career, Rebeca has been directly involved in research, design, land development, construction project management, asset management, and finance of single and multi- family housing projects. She has also worked as an independent consultant, designer, licensed general contractor, and college instructor. Her expertise includes developing affordable housing, managing government funded programs and writing competitive funding applications. Working in partnership with various grant-making organizations and lenders, she has successfully secured funding for operations, resident services, land acquisition, project development, construction, and permanent mortgages. Besides her proven track record in affordable housing, Rebeca has shown a strong commitment and passion to serving and improving the communities where she lives and works. Her current and former affiliations include associations of Latinas, housing developers, builders and architects, in addition to serving as a member of several boards and committees relevant to affordable housing, parish ministries, internships, education, health, and community development.